Should you be worried about acanthamoeba keratitis? An unusual disease in which amoeba - microscopic organisms - infect the cornea of the eye. The disease is an infection within the eye caused by acanthamoeba, microscopic single-celled organisms. These amoebas are rather common, and can be found just about anywhere that fresh water exists. This includes natural sources, like river, lakes, ponds, and even damp soil, but also man-made sources, like spas, swimming pools, and even the water that comes from the tap on the kitchen sink. How can I avoid a Acanthamoeba Keratitis infection? It's an incredibly rare infection, but nearly all cases that do occur involve people who wear contact lenses, that have not been correctly cleaned and disinfected. Through poor hygiene and unsafe practice of contact lens use, like swimming while wearing contacts, acanthamoeba can get transferred from any one of its many sources onto the surface of a contact lens. Once the lens in placed on the eye, it can not only survive, but thrive and multiply. As they grow in numbers, and the infection takes hold, symptoms will begin to show. Various studies have shown that this infection can arise from using tap water to soak lenses in, rather than using a proprietary lens soaking solution. What Are The Symptoms Of Acanthamoeba Keratitis? The signs of acanthamoeba keratitis aren't that dissimilar to many other types of eye infections and diseases. The eyes will likely become red, watery, and painful, especially after removing the contact lenses. There may also be sensitivity to light and even blurred vision, along with the sensation of a foreign body on your eye. An infection of acanthamoeba keratitis begins when the organism gets into the eye and begins secreting proteins. This secretion causes the cornea to dissolve and the amoeba begins to eat the healthy bacteria that normally live inside the eye, as well as cornea tissue. Those who suffer from this disease usually show symptoms including acute pain, inflammation and redness in the cornea. In severe cases, circular ulceration may also be found. If detected early, the infection can be cared for quickly and effectively, however if left untreated for too long, significant damage can occur to the eye, and those suffering from the illness could even become blind. The best advice for anyone experiencing any of these symptoms is to seek out professional medical attention as soon as possible. Any delay is medical treatment will allow the acanthamoeba to multiply, worsening the infection. How Is Acanthamoeba Keratitis Diagnosed? Under ideal laboratory situations, acanthamoeba can be detected by placing suspected samples on agar saline plates along with specific types of bacteria, such as E. coli, which will promote the reproduction and growth of the amoeba. The culture is then viewed under a microscope, where a trained professional will be able to identify them by their blob-like, single-cellular appearance. While acanthamoeba are nearly impossible to see with the naked eye, they are rather large in comparison to bacteria, and far larger than the human cells that comprise the eye. However, in real world practice, most cases of acanthamoeba keratitis are diagnosed once the treatment for the first (and inaccurate) diagnosis of conjunctivitis proves to be ineffective. Usually, around the same time that it's clear that antibiotics aren't working, the infection has progressed to the point that a circular, ring shaped ulcer has begun to develop around the eye's cornea. How Is Acanthamoeba Keratitis Treated? The treatment method used is largely dependent on how far the infection has progressed. If caught early enough, the disease can be treated with one of a number of available drugs. The most commonly prescribed medications are polyhexamethylene biguanide (PHMB), Propamidine isethionate, and chlorhexidine. In severe cases, simply killing the acanthamoeba won't be enough, as the infection has caused serious and irreparable damage to the eye tissue. In order to restore the visual impairment caused by this damage, a keratoplasty may be necessary, which is a complete removal and replacement of the eye's cornea. The worse the infection becomes, the more likely there will be permanent visual acuity loss. Vision may become blurry or clouded, and while partial visual restoration may occur once the infection has been eliminated, it may not return to the level of clarity that existed prior. The disease is very easy to prevent, but very difficult to treat. Even with proper medical care, there is a serious risk of severe visual impairment or blindness. 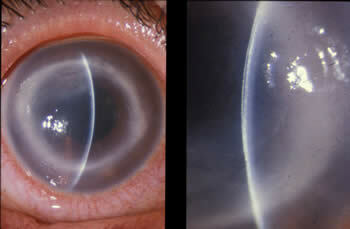 In some cases, complete corneal transplants may be required, which can me complicated and challenging to recover from. How Can Acanthamoeba Keratitis Be Prevented? The best method of prevention is to practice safe contact lens hygiene, and not take any unnecessary risks that may contaminate either the contacts themselves, or the eyes. First and foremost, follow any instructions given by the eye doctor at the time of fitting. Each and every person is different, and eye care professionals are trained to give tailored advice and training on proper contact lens care. Only use safe and approved lens cleaning and storage solutions. Using regular tap water can be tempting in a pinch, but it's not sterile, and is likely to result in an infection. Swimming, bathing, and spa usage are all best done after contact lenses have been safely removed. Partaking in water based activities while wearing contacts creates an opportunity for infecting bodies to find their way onto the lenses, and eventually the eye. Always wash your hands before putting in or removing your contacts, and use fresh cleaning and storage solution every time. Recycled fluids can harbor many types of dangerous, single-celled organisms.